The birthday cake conversation has changed over the years. There was a time when I would ask Kurt what kind of cake he’d like for his birthday, and the answer was chocolate. No pondering, no pause, no prompts for suggestions. Just chocolate. In recent years, the answer hasn’t come quite so quickly. He still likes chocolate but wants to hear other ideas too. This year, I presented three options that I thought he’d like, and he chose this lovely, layered creation with white cake and spice cake topped with chocolate fudge frosting and chopped walnuts. It’s from Saveur, and the recipe is online. It’s simpler to make than it appears because you only mix one cake batter rather than two. After making the white batter and pouring half of it into a pan, you add spices to the remaining half before pouring that into a second cake pan. I liked that approach. And, the frosting was something new and different to me. It’s cooked on the stove and brought up to just below soft ball stage before being mixed briefly to fluff it up a bit. Then, you have to work quickly to top each layer and cover the cake before the frosting sets. Next time I make it I’ll know just how quickly it sets up and once it does, there’s no moving it. My only regret with this cake was that I didn’t really get the walnuts pressed into the sides of the cake because the frosting set so quickly. The fine powder of the walnuts stuck to the frosting on the cake sides but not the bigger pieces of nuts. In the end, I placed the nuts around the edge on top of the cake and around the bottom edge which was good enough. Kurt was happy with his choice, and I was thrilled with the spice cake flavors mingling with the chocolate fudge frosting. Although the recipe suggests using vegetable shortening, I never use it. I used butter instead which worked perfectly well and gave the cakes better flavor. Before mixing the cake batter, dry ingredients were combined, and wet ingredients were combined separately. Also, the spices including cinnamon, allspice, cloves, and I added nutmeg were mixed in a small bowl and set aside. 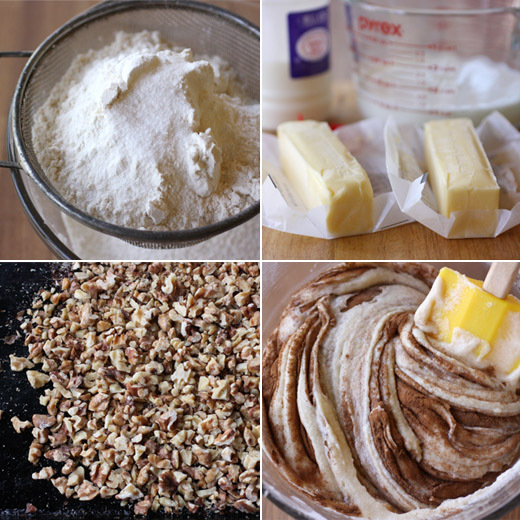 In a stand mixer, butter and sugar were creamed before egg whites were added. I had a laugh at the recipe which states “add egg whites one at a time.” Of course, I had already separated all six egg whites into one bowl. I just slowly added them a little at a time while mixing. Have you ever separated egg whites into separate bowls? The dry ingredients were then added in three batches with the wet ingredients being added alternately in two batches. Half the batter was poured into a nine-inch prepared pan, and the spice mix was stirred into the remaining batter before it was poured into a second cake pan. After the cakes baked and cooled, each layer was cut in half horizontally. 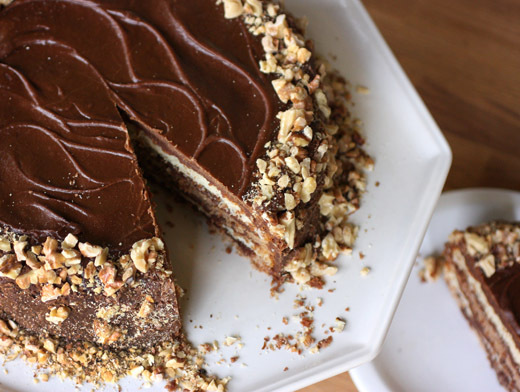 You’ll want to have the layers sliced and ready for the frosting. To make the frosting, sugar, milk, butter, and cocoa powder were brought to a boil and cooked while stirring until the temperature reached 232 degrees F which took about 30 minutes. Then, off the heat, vanilla and baking soda were added. With a hand mixer, the frosting was mixed for only about one minute. And, then you have to work very quickly. A spice cake layer was placed on a cake stand, and it was topped with frosting. A white cake layer was added followed by more frosting. You’ll feel as you spread the frosting that as soon as it’s spread thinly, it cools and sets. Quickly, quickly, the next two cake layers were added, and the top and sides were frosted. I spent too much time making swirls on top of the cake and didn’t realize the frosting on the sides was meanwhile setting up too much for the walnuts to stick. Lesson learned. Who knows where the birthday cake conversation will lead next year. Maybe we’ll circle back to plain chocolate. I do know that Kurt will pick his cake more quickly than I ever pick my own birthday cake. I can never easily decide what kind of cake I want, and my birthday is only a little over a month away. I should probably start thinking about this now. A splendid cake! So irresistible. This is a very special cake for our loved ones. Delicious combination of flavors! The only thing that'd make it even better, is to have it in front of me. Oh my. Just... wow. I want someone to bake that cake for me. In fact, *I* may bake that cake for me! Sounds delicious and nice to have someone else try it and warn us of the pitfalls. This looks rich and divine, Lisa. I actually liked the way the sides of your cake had only a little covering with nuts, to me it looks better, more elegant, and composed. Lisa, boy does that look good. Your husband is a lucky birthday guy! You did such a great job decorating this cake! Oh, it's too pretty to eat! It looks delightful and I thought that effect on the sides was what you were going for to create a texture difference between the top and the sides. Lisa, this is an adorable cake! Perfect for birthday! Love the walnuts on the sides! It's gorgeous, Lisa. Too bad the frosting set so quickly, but thanks for letting us know. A beautiful cake and a quick save on the walnuts, Lisa. Never would have known about the walnuts on the sides of the cake, I think it is a stunner just as it is! What a delightful birthday cake! What a beautiful cake Lisa, I especially like the crunch texture of the walnut with the creaminess of the chocolate...yum! My birthday is on Monday and I thought I had chosen a cake but you've shook things up with this! Looks amazing! This is gorgeous. I love walnuts and with chocolate too? Pinning this lovely creation. That fudgey frosting looks amazing! 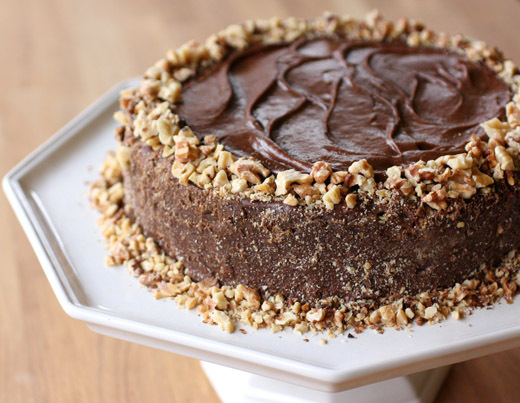 I love walnuts with chocolate so I know I would gobble this cake up! Oh, I love it! I think white or spice layers is perfect IF the frosting is chocolate. How beautiful! Oh my, that is one gorgeous looking cake. The only thing wrong with it is that I don't have a slice of it. What a beaut! That cake would make any day feel extra special. Lovely and , just in case life gets busy, I'll get it i n early: I hope you have a happy birthday!